Bloom continues to progress slowly due to cold and stormy weather through most of the weekend. 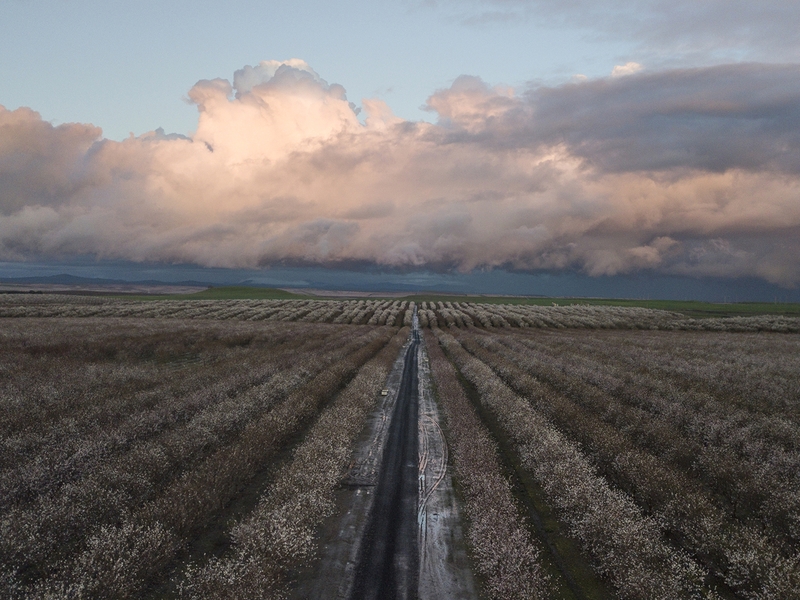 Friday and Saturday saw a return to cold, stormy weather that slowed bloom progression after the slightly warmer weather on Thursday. 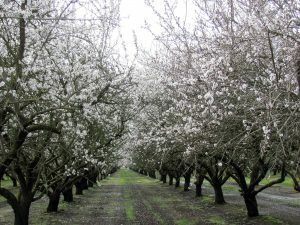 On Friday and Saturday there was no more than 5% of progression on Nonpareil, Monterey, and its California type pollinizers. Observers in the Madera area noted that Monterey had appeared to fall behind Nonpareil due to the cold weather. Sunday afternoon brought sunshine and slightly warmer weather throughout all growing regions, slightly accelerating the pace of bloom. 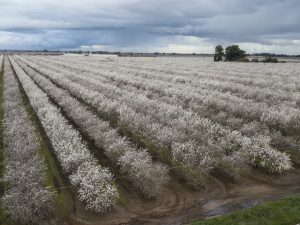 By the end of Sunday, Nonpareil in the southern and central regions had around 20% of their flowers open for pollination with Monterey and California type pollinizers a day behind. Butte and Padre are beginning to show trace amounts of open flowers. The Sacramento Valley is at least 2 days behind the other growing regions due to the colder nature of their storm fronts. Sunshine and calmer winds on Sunday afternoon did give bees a small chance to fly for a few limited hours. Bee activity has been limited to short windows of sunshine in between storm cells. 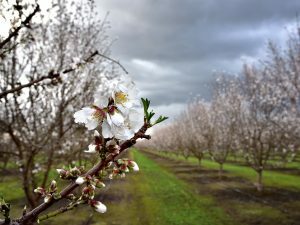 Activity has been limited even more in the Sacramento Valley due to the higher intensity and cooler temperatures of the storm fronts. 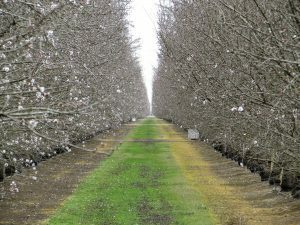 With a short window of dry, calmer weather growers are preparing to treat for bloom time diseases. 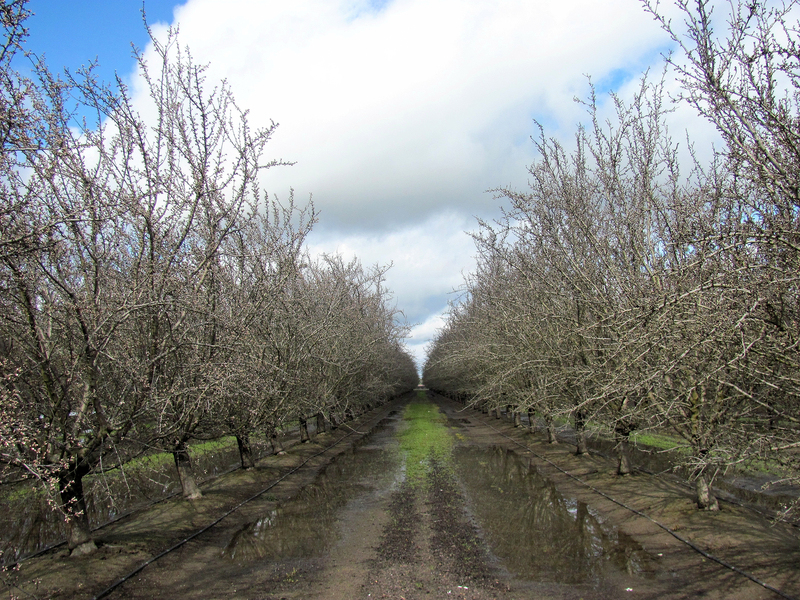 Growers are planning to make ground applications where they’re able to get into their orchards. Arrangements for aerial applications are being made where the ground is too wet. Wind: 8 mph. Gusts up to 20 mph. Bee Activity: 2 hours of fair activity. Wind: 4 mph. Gusts up to 8 mph. Rain: .2" during morning hours. Wind: 5 mph. Gusts up to 11 mph. Rain: .1 to .5" throughout the day. Bee Activity: 2 hours of poor activity.